Exceptional autumn weather at the top of the South Island meant farms were presented for sale in extremely good condition, while stock prices across the board continued to increase the desirability of pastoral property. However, demand exceeds the supply of listed Nelson and Marlborough sheep and beef farms, with those few that were offered attracting strong enquiry at favourable prices. A 500 hectare St Arnaud grazing block attracted plenty of interest before selling well in late May, while market activity in Murchison and Golden Bay also indicates good prices can be expected for upcoming sales in those two districts. 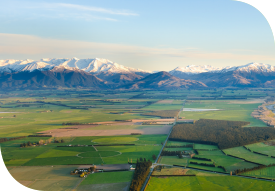 Pending the continuation of elevated red meat prices, plenty of rural property market activity is likely in the coming months, with particular encouragement for anyone looking to sell a Nelson or Marlborough farm in the spring. Since the change of government last year, international corporate buyers previously motivated to buy larger dairy farms have taken a spell until new requirements for overseas investment are clarified. Uncertainty around environmental compliance, capital gains tax and Mycoplasma bovis also cooled enthusiasm. Apart from a small number of Canterbury dairy properties sold to local buyers in the autumn, at values slightly down on last year, transactions were scarce. Meanwhile, with feed, climate and commodity prices all in their favour, Canterbury pastoral farmers prefer the cashflow on offer to making property available for sale. Sheep and beef farm transactions were therefore similarly reduced in quantity. Until the factors preoccupying the region’s dairy sector settle down, little will change in the property market, though some Canterbury farmers are likely to offer their farms to the spring market, particularly sheep and beef. Entry level dairy properties around 100 hectares, producing in the range of 100,000 kilograms of milksolids per annum, and priced at between $2.0 million and $2.3 million are in ready supply on the West Coast. Values range from $13,000 per hectare, ensuring these listings represent a realistic opportunity for sharemilkers to step into farm ownership, and Whataroa and Kowhitirangi farms with these specifications have attracted interest from first-time buyers during the autumn. Although the region’s weather was not kind to farmers through the autumn, with persistent precipitation holding back production, confidence in the payout is increasing. Depending on the performance of local co-operative Westland Milk Products, which its West Coast shareholders monitor carefully, and which is currently projecting a payout of $6.10, more West Coast dairy farms are likely to come onto the market during the spring. Demand for Mid and South Canterbury drystock property is heavy. A 589 hectare Limestone Valley grazing property attracted multiple potential buyers before selling well in late autumn. Facing the challenge of Mycoplasma bovis, several of the region’s dairy farmers are seeking grazing and support blocks, looking to establish standalone dairy units, ensuring greater control of their stock management and therefore mitigating the risk of the infection. With doubt prevailing on government policy around foreign investment, buyers for large dairy farms are scarce. A subdued winter rural property market is in prospect. Depending on the payout, when spring arrives, some of the region’s less sought after dairy farms are likely to attract attention from sheep and beef farmers considering decommissioning the cowsheds and converting these properties into beef finishing blocks. Any farm that changes hands in this scenario will be revalued accordingly. A highlight of the Otago market during the autumn was the sale of Altavady, a substantial North Otago pastoral farm, which sold in early May. In the same family ownership for three generations and presenting various farming options, though traditionally raising sheep and beef, the property was purchased for development as a grazing unit to support existing Waitaki Plains dairy farm holdings. Also notable was the sale of 835 hectare Rutherglen, at Waitahuna, South Otago, which had been in the tenure of the same family since 1880, and was also purchased locally. An Otago listing that will be closely observed is 6404 hectare Huntleigh Station, an extensive Middlemarch sheep and beef fattening property that bounds the Taieri Gorge It is owned by New Zealand Pastures Limited and is likely to be the largest New Zealand farm offered for sale in 2018. Autumn sales of Southland properties greater than 100 hectares were half the number of transactions for the same period last year. Although ready buyers for any property of scale were rare, one recent notable sale that belied that trend was Jericho Farm, an extensive, traditional 1,359 hectare Southland sheep and beef property, with a balance of tussock hill country and river flat paddocks, used to fatten lambs and young cattle. It was formerly in the Landcorp portfolio, and sold in April to a local buyer for around $1,000 per stock unit. With next year’s commodity returns forecast to be favourable for every category except coarse crossbred wool, some optimism should return to the region’s spring rural property market and, if prices have eased in the past 12 months, there will be opportunities for buyers who are ready to take them. Read more articles from our Rural Property Pulse, here.